A filter and two mason jars are all you need to make cold brew at home. This full-fledged cold brew maker is super straightforward. The filter screws onto both jars, and sieves out the coffee grounds. The result? A fresh, smooth-tasting, cold-brewed coffee that’s less acidic and gentler on your tummy and teeth than coffee brewed with heat. Dimensions: 9" x 8" x 7"
The coffee-loving recipient enjoyed this! A good invention that works well and is simple , I'm happy to support a young inventor who also happens to be from Michigan . Love this! I have more complex cold brew systems but this is better. Simple is often better! 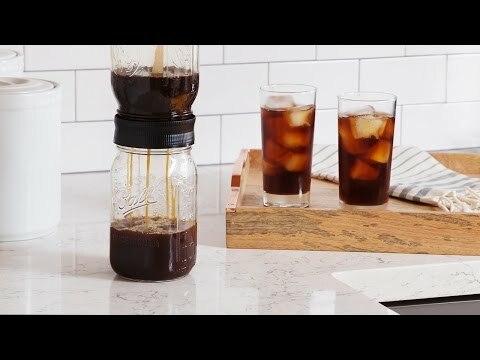 Make your very own cold brew coffee, easily. Put this cold brew coffee maker filter onto a wide-mouth mason jar. It’s super straightforward. Let coffee grounds soak in a cold-water-filled mason jar for over twelve hours. When you’re ready to get your caffeine dose, twist the filter onto that jar with the straw side down. Then twist the second mason jar on top of the filter. Flip. Shake. And watch your cold brew filter through. In case you’re uninitiated to cold brew, it’s smoother, less acidic, and it’s easier on your tummy (and teeth, too) than coffee brewed with heat. Less acidity also means you can better taste all the subtle flavors—like traces of chocolate, fruit, and nut inherent in different beans. And even though grown-ups are the ones most likely to enjoy their coffee, this filter was invented by a teen. Max Feber was just 16 when he came up with the idea. It’s one you’ll be able to enjoy every day.